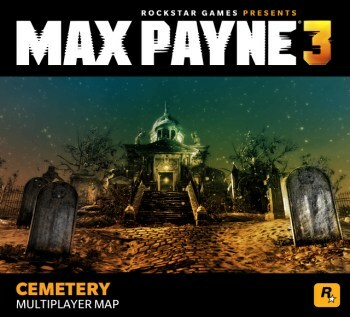 Gamers who pre-order Max Payne 3 are in for an extra-special treat: early access to the multiplayer map Cemetery, where Max's wife and infant daughter are buried. You may or may not know this about Max Payne, but before he was a psychopathic tough guy struggling with alcoholism and an addiction to painkillers, he was a devoted family man with a loving wife and newborn baby daughter. Then one day they were brutally murdered, a tragic slaughter Max actually stumbled upon mere moments too late to prevent. In fact, now that I think about it, I suppose it's possible that the gut-punch devastation of that moment and the months and years of emptiness that followed might have even contributed to his slow-burning breakdown. Anyway, it was some pretty unpleasant business all the way around but if you're enough of a fan to lay down your money in advance, you can go back and enjoy it all over again in Cemetery, a multiplayer map of special significance that will be given out as a pre-order bonus weeks before it's made available to the public at large. "The final resting place of Max's young wife and daughter, Cemetery represents the tragic past Max cannot forget," Rockstar said. "With a wintry New York City skyline, sniping positions amongst the monuments, destructible tombstones, circular fighting arenas in a rotunda garden and a looming mausoleum, it makes a fitting final home for your enemies." The map will be given out for pre-orders of both the standard and special editions of the game, which means that if you play your cards right you could potentially lay waste to your enemies with Mona Sax's sniper rifle while taking cover behind your wife's gravestone. Man, that is seriously messed up. Max Payne 3 is set for release in March 2012 for the Xbox 360, PlayStation 3 and PC.